How I make my delicious hot chocolate. Hello and welcome to my Blogmas series! I’ve got tons of great content for you this month so be sure to check out the other posts here! So one of my favorite parts about the colder months, is that I get to spend tons of time cozied up inside the house blogging, watching Netflix, and drinking hot chocolate with my kids. 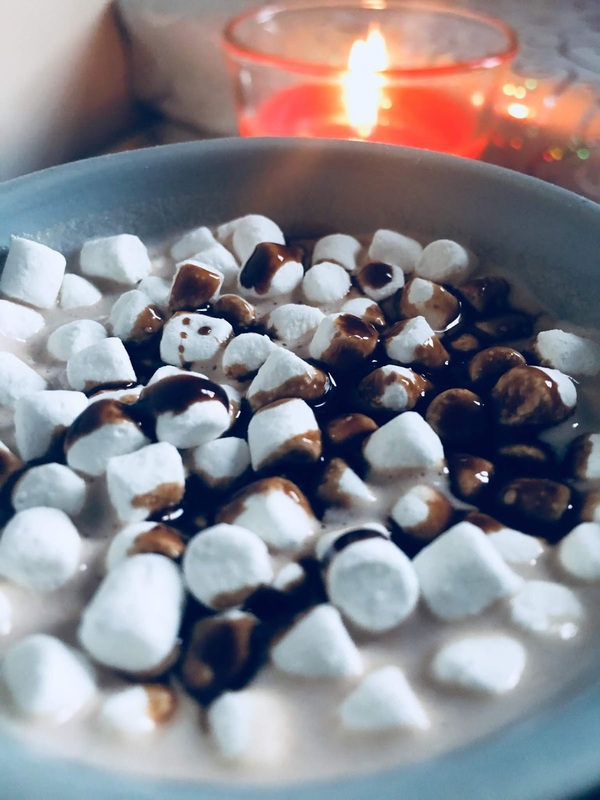 I love hot chocolate so much and I used to always go to the coffee shop to get it, but when I decided to start changing my financial life, I had to start making it myself. I tried making my own home made hot chocolate from scratch and to be honest, It didn’t taste good to me. I don’t know if I just had the wrong recipe or what, but I really didn’t like it and so I went back to square one. Promote your blog in my awesome Facebook group, Bombshell Bloggers! When all else fails, I went back to my childhood love. Swiss miss hot chocolate packets. My mom used to make me these when I was little, and it just brings back so many memories. It’s quick, easy, and you can get a box of these at the dollar tree. Can’t beat that! Read: My Christmas Bucket list. There are a few things that I like to add to my hot chocolate to make it extra delicious and I want to share them with you. Let me know If you try it! I make the hot chocolate with milk, not water-always. I know it can be common to make your hot chocolate with water, and my mom sometimes did this for us. But really, the only way to make it is with milk. I stir in some marshmallow sauce. Not to be confused with marshmallow fluff, you can find the marshmallow sauce with the ice cream toppings at the store. I used to always love going to dairy queen as a kid and getting chocolate ice cream with marshmallow sauce, so when I found out that the sauce I loved as a kid was now available in my local grocery store, I had to get it. The problem was that I didn’t really use it much because I don’t eat ice cream as much as I did when I was a kid. So one day I was making some hot chocolate and I decided to add some sauce in…WHOA. Super delicious! Just be careful though not to add too much, your drink will be too sweet. I add chocolate syrup. Yep. Chocolate and marshmallow syrup added in to the traditional swiss miss packets makes it scrumptious. Again, I don’t add too much or else it will become much too sweet. I top it off with mini marshmallows: Okay so did you know that you can purchase the lucky charms marshmallows on their own? You can find them in select grocery stores usually where the marshmallows are. I add them to my hot chocolate once I’ve poured it into my mug and it just tastes SO incredible! That’s it! Super simple, at home hot chocolate. Happy Holidays! That sounds AMAZING!!! :) I can't wait to try it. Oh my word! This looks so delicious! Making this ASAP! I don't think I've ever heard of marshmallow sauce. Sounds amazing! It is so early and my mouth already started watering. Trying this ASAP.